What Type Of Wood Is Best For Hardwood Floors? Thinking of installing hardwood floors in your home? What type of wood works the best? All types of hardwood floors have an unmatched natural beauty that can go with any decor. However, not all woods offer the same benefits to every room in your home. Kitchens, bathrooms, and basements all warrant special considerations. 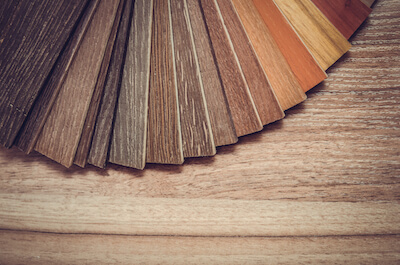 If you install unfinished hardwood, you can select a custom stain to match your preferences. After hardwood flooring installation, the flooring is given several coats of stain and protective finish to give you a final look you desire. If you’re thinking of adding hardwood to a kitchen, unfinished flooring is a good choice because the seal will penetrate between the boards, helping to prevent water from seeping between the boards. Prefinished wood is great because it comes from the factory already sanded and sealed. It makes for easy installation. Solid hardwood flooring is all wood. Because it’s solid wood, it can be sanded and finished over and over again. However, it is susceptible to humidity and is not recommended for below-grade basements. Engineered hardwood is a veneer of real wood attached to several layers of wood underneath. This gives it more stability over time and makes it a good choice for below-grade basements. Depending on its thickness, it can be sanded and refinished up to a half-dozen times. What are the best species? Take a look at your hardwood options, and you’ll find there are many species available. You’ll likely find a variety of common woods, such as oak, maple, and cherry. Other wood species have entered the marketplace and make excellent choices: bamboo, walnut, ash, and mahogany. You can even create uniqueness throughout your home by getting into exotic woods such as teak, jarrah, and mesquite. In all cases, be sure you select wood that comes from sustainably harvested forests. What look are you going for with the hardwood in your home?